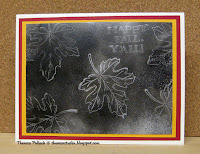 This week's technique challenge on Gina K's Stamp TV is to use Soot Stamping. This technique is to add soot from a candle flame by moving the CS quickly over the flame. Rather than tell you how, go check out her video at stamptv.com. Or, go the bottom of my blog and find the video. After "sooting" the CS, stamp directly onto the soot and see what you get. You then have to spray with a fixative to keep from rubbing off. I made this card and finished it very simply......no embellishments.. just matted on red and yellow CS and onto a ivory base CS. Of course it took some practice and I still need to practice more. I admit I did burn the corner of one of my practice cards. I was disappointed that I got too many spots from the fixative... you can expect to have some. My DH did come to watch ....I think he was making sure I did not burn the house down. This is the card I am going to post to Stamp TV but it could be better. This card is wonderful! You are your own worst critic! You must be able to see the spots from the fixative better in real life, they don't show from here! This is a great card. Your soot stamping turned out beautifully!